BACKGROUND: Motor vehicle collisions and pedestrian injuries in areas where schools are located are public health problems in Durban. OBJECTIVE: To evaluate the effect of traffic calming humps on the number and severity of incidences of collisions and injuries in the Chatsworth and KwaMashu residential areas of the eThekwini Municipality. METHODS: The evaluation used an observational interrupted time-series study design, with data obtained from the eThekwini Traffic Authority for roads constituting the routes to 34 schools for 2 years prior to and following the implementation of road humps (excluding the intervening year of implementation). A non-probability convenience sample of 19 schools with 39 roads in Chatsworth and 15 schools with 24 roads in KwaMashu was selected. RESULTS: The traffic calming humps improved safety in both areas with respect to the severity of collisions. Serious pedestrian-vehicle collisions (PVCs) dropped by 23% and 22%, while fatal collisions decreased by 68% and 50% in Chatsworth and KwaMashu, respectively. The median annual PVC rate/km of road/year decreased from 1.41 to 0.96 (p=0.007) and from 2.35 to 1.40 (p<0.001) in Chatsworth and KwaMashu, respectively. There was a 1.6% reduction in the median number of fatal or serious PVCs after implementation in Chatsworth (p=0.03) while in KwaMashu, although the number of collisions decreased, the median number increased by 9% (p=0.07). CONCLUSIONS: Traffic calming has been shown to be effective in reducing the number of PVCs but needs to be supported by additional measures to further improve the safety of pedestrians. While road transport systems are a major global developmental achievement, morbidity and mortality caused by road-traffic injuries (RTIs) place a huge burden on countries' economies. 'Injuries' and 'collisions' are the preferred terms, since they are predictable and preventable, while accidents are random, inevitable events. It is estimated that RTIs cost approximately 2% of the Gross National Product (GNP) of high-income countries, while the figures for middle-income countries (MICs) and low-income countries (LICs) are 1.5% and 1%, respectively. LICs and MICs experience the greatest burden of motor vehicle collisions (MVCs). Globally, an estimated 1.2 million people are killed annually in MVCs while an estimated 50 million are injured. In LICs, vulnerable road users such as pedestrians, scholars and cyclists account for the majority of road deaths. According to the South African Medical Research Council Burden of Disease report (2000), MVCs ranked 7th in the top 20 underlying causes of death. In 2006, an average of 27 people were killed on roads in South Africa (SA) every day, with 6 of those deaths occurring in KwaZulu-Natal Province (KZN). In 2008/2009, fatal MVCs cost the SA economy R12 675 billion, with KZN accounting for approximately 20% of this (R2 560 billion). The majority of collisions occur in urban areas and are often associated with speeding and reckless driving. The victims are frequently vulnerable schoolchildren. From 1994 to 2003, there were 6 400 road-traffic deaths in the eThekwini Municipality, of which nearly 20% were children. In addition, there were 30 000 serious injuries which cost the city R14 billion. The municipality's 5-year road safety plan for 2005 - 2010 identified Chatsworth and KwaMashu as 2 of 5 municipal areas with the greatest number of pedestrian collisions.161 From 2000 - 2002, 1 675 and 3 004 road collisions were reported in Chatsworth and KwaMashu, respectively, many involving children younger than 10 years of age. In November 2001, the eThekwini Council Executive Committee introduced a traffic calming intervention to reduce speeding and excessive through volumes on roads not designed for that purpose. This involved introducing speed humps on a localised but area-wide basis to prevent the migration of traffic to other minor roads. In KwaMashu, where road infrastructure improvements had previously not been a priority, traffic calming interventions were introduced during the 2005/2006 financial year at a cost of approximately R7 million; an additional amount of R1 million was spent on road maintenance, which included tarring roads and constructing sidewalks in the implementation areas. A 2003 Cochrane systematic review, also involving studies of residential urban areas in 16 high-income countries, evaluated the effectiveness of a combination of traffic calming measures such as speed humps, signage, mini-roundabouts and pedestrian crossing facilities in preventing MVCs, injuries and fatalities. The review found an 11% (pooled rate ratio 0.89, 95% confidence interval (CI) 0.8 - 1) decrease in the number of fatal and non-fatal RTIs. Traffic calming reduced vehicle speed, and resulted in less severe injuries, where collisions did occur. A systematic review of traffic calming schemes in 2000 - 2008, 32 km/h (20 mph) speed restricted residential areas in the United Kingdom (UK), reported 60% fewer collisions, 70% fewer child pedestrian injuries, a (15 km/h) slower average vehicle speed and a 48% reduction in child cyclist injuries. [10-12] The conclusion was that traffic calming was effective in reducing child injuries. A matched case-control study in an urban area in California found that the introduction of 1 600 speed humps reduced child pedestrian injuries in children younger than 15 by 53% (adjusted odds ratio (OR) 0.47) and 60% (adjusted OR 0.4). Two further Cochrane systematic reviews revealed that traffic calming was more effective than educational programmes in reducing child traffic injuries. To evaluate the effect of traffic calming on the number and severity of pedestrian injuries and on MVCs in two residential areas of eThekwini Municipality and to make recommendations based on our findings. The study was conducted around schools in the Indian residential area of Chatsworth in the south and in the black African township of KwaMashu to the north of the eThekwini Municipality, two areas with the highest number of PVCs in the city. This population-based, epidemiological research used an observational, interrupted time-series before-and-after study design that assessed vehicle and pedestrian-vehicle collision (PVC) data on school route roads over a 5-year period; 2 consecutive years prior to and 2 consecutive years following the implementation of speed humps with the year the speed humps were installed being excluded from the analysis. Each road acted as its own control. The annual MVC and PVC ratio was calculated per length of road in kilometres where traffic calming had been implemented around each school. A retrospective secondary analysis of data was performed by the eThekwini Traffic Authority (ETA), which also provided the length of route to the school road and the year of construction of the traffic calming humps. The collisions were recorded on the Accident Report Form by the police officer at the scene of the accident and then entered into the ETA database. SPSS version 15 was used for statistical analysis. As the data followed a non-Gaussian distribution, medians and interquartile (IQR) ranges were calculated. The Wilcoxon rank-sum test was used to determine whether the difference in the total number of collisions and PVCs, pre- and post-implementation of traffic calming, was statistically significant (p<0.05). The Mann-Whitney test was used to determine differences in outcomes between school access roads and other roads, roads serving >1 school or not, and the difference between schools that had 'lollipop men', adjacent sidewalks installed and targeted road safety education and those that did not. The safety effect of traffic calming on the total number of MVCs and PVCs in Chatsworth and KwaMashu was calculated by dividing the number of collisions after implementation in an area with traffic calming by the number of collisions beforehand. The estimate of the effect in this study was defined according to the numerator of the OR: if the estimate of the effect was <1, road safety had improved; if 1, then safety was unchanged; if >1, safety had deteriorated. The study was approved by the Biomedical Research Ethics Committee of the College of Health Sciences, University of KZN and the Research Ethics Committee of the eThekwini Municipality Health Unit. Permission to conduct the study was also granted by the ETA. Of the 34 schools included in the study, 16 (84%) in Chatsworth and 10 (67%) in KwaMashu were primary schools with children up to Grade 7, or 12 years of age. Speed humps had been introduced around these schools on 39 roads in Chatsworth and 24 in KwaMashu. In KwaMashu, 67% of the roads with speed humps served 2 schools compared with 46% in Chatsworth. A 'lollipop man' was employed in 13 (68%) schools in Chatsworth but only 1 (7%) in KwaMashu. All study roads were tarred and had sidewalks or pavements. Road-safety education was introduced into the public school Life Orientation curriculum in 2001. The 5 most common collision types reported were rear-end, vehicle-pedestrian, right-angle turn, reversing and right-angle straight. PVCs in KwaMashu accounted for 163 (38%) collisions in the 2 years prior to speed humps being installed. This decreased by 41% (n=96) following the intervention. In Chatsworth, there were 553 (12% of the total) PVCs before and 455 after the installation of speed humps, a reduction of 18%. Rear-end collisions increased by 94% (from 36 to 70) in KwaMashu and by 30% (from 1 743 to 2 267) in Chatsworth. Both the median number of MVCs and PVCs decreased in the 2 years post implementation in both Chatsworth (pre 38, IQR 13 -256 v. post 29, IQR 15 - 335) and KwaMashu (pre 8, IQR 3 - 27 v. post 4, IQR 2 - 32). The total number of collisions increased by 11% (pre 4 770 v. post 5 315) in Chatsworth and decreased by 15% (pre 425 v. post 362) in KwaMashu. Annualised rates were used for comparison (Table 1). Both KwaMashu (pre 1.4, IQR 0.3 - 4.4 v. post 1, IQR 0.4 - 4.4) and Chatsworth (pre 2.4, IQR 0.9 - 3.9 v. post 1.4, IQR 0 - 2.1) showed a statistically significant decrease in the median PVC rate post installation. Chatsworth had a statistically significant (p=0.001) increase in the median annual MVC rate following the installation of speed humps from 11.3 (IQR 4.5 - 39.2) to 11.9 (IQR 4.8 - 41). In comparison, KwaMashu had a statistically significant (p=0.042) decrease in the annual MVC rate following the installation of speed humps on the roads forming the route to schools from 4.8 (IQR 2 -8.9) to 2.2 (IQR 0.8 - 10.4), a 55% reduction. (under 19 years of age), decreased by 39% (from 168 to 102) and by 33% (from 52 to 35) in Chatsworth and KwaMashu, respectively. While the majority of pedestrian casualties sustained minor injuries (Chatsworth: pre 354 v. post 313; KwaMashu: pre 128 v. post 65), the severity of injuries decreased in both areas post implementation. The number of deaths decreased from 22 to 7 in Chatsworth and from 2 to 1 in KwaMashu (Table 2). 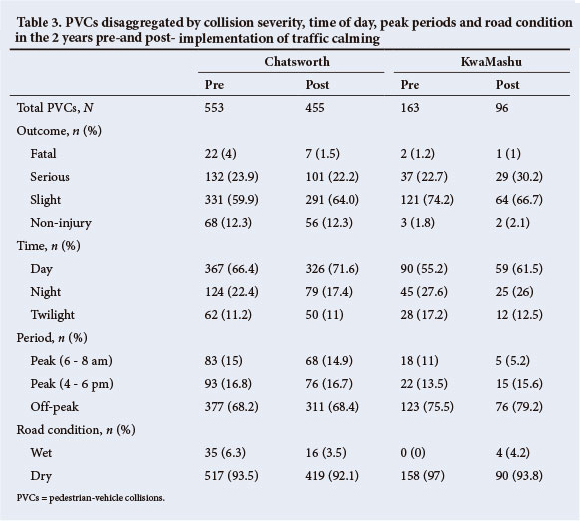 The number of PVCs was disaggregated by collision severity for the study time period (Table 3). 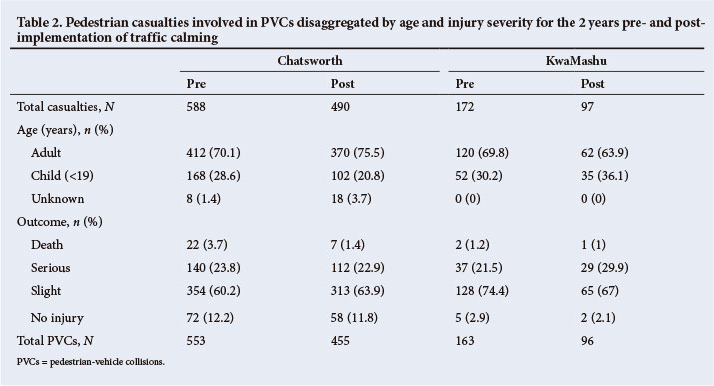 In Chatsworth, an average of 62% (pre 331 v. post 291) of the PVCs were of minor severity while in KwaMashu two-thirds (pre 74.2% v. post 66.7%) fell into this category. Serious collisions accounted for >20% of the total in both areas (Chatsworth: pre 132 v. post 101; KwaMashu: pre 37 v. post 29), while non-injury and fatal collisions accounted for the remainder. The majority of PVCs occurred during daylight hours; more than two-thirds (pre 367 v. post 326) in Chatsworth and more than half (pre 90 v. post 59) in KwaMashu (Table 3). Approximately 20% and >25% of PVCs in Chatsworth and KwaMashu, respectively occurred at night, with the remainder during the twilight hours. The 2 most common vehicle types involved in collisions in these areas were cars and minibus taxis. Chatsworth recorded a 24% decrease (n=97) in the number of motor PVCs post intervention, but the median number of collisions remained the same (2). KwaMashu had more minibus taxi-pedestrian collisions than Chatsworth (pre-intervention 22% v. 18%, post-intervention 27% v. 17%). Bus-pedestrian collisions accounted for 5.5% (n=9) of the total prior to the intervention and increased to 7.3% (n=7) in the 2 years post installation. In Chatsworth, there was a 9% overall deterioration in safety (number of MVCs after implementation compared with the number of collisions before) and the safety effect was >1 (Table 4). The area experienced an improvement in safety with respect to PVCs (a reduction of 18%) on all roads with speed humps. The traffic humps improved safety on roads in KwaMashu with respect to all types of collisions, resulting in a 15% reduction in MVCs. The most significant safety effects were observed with regard to fatal and slight collisions in Chatsworth, and fatal and serious collisions in KwaMashu (Table 5). Non-injury PVCs were reduced by 18% and 33% in Chatsworth and KwaMashu, respectively while collisions of minor severity were reduced by 12% in Chatsworth and 47% in KwaMashu. Serious PVCs were reduced by 23% and 22% in Chatsworth and KwaMashu, respectively. Fatal collisions decreased by 68% in Chatsworth and 50% in KwaMashu. Overall, pedestrian safety improved by 23% in the 2 study areas (Table 4). The decrease in MVCs and in the annualised median collision rate, post-implementation in KwaMashu, is consistent with the findings of the meta-analysis.™ The decrease in the median annualised PVC rate was statistically significant in both areas. This is consistent with the findings of other studies on traffic calming. [8-10,12] The decrease in PVCs in KwaMashu was greater than in Chatsworth, which may be ascribed to resurfacing of roads with tar and the addition of sidewalks for pedestrian use. This study suffered from several limitations that could introduce bias. Regarding access to the database, these include collisions not having been reported to the police, no Accident Report Form being completed, incorrect data being entered into the database and inaccurate estimation of traffic volumes. • adequate and accessible parking areas for motor transport. Recommendations to the ETA include collecting data on traffic volumes, standardising definitions in the database, and collaboration between the police and the ETA to react to changing accident statistics around schools. The study has illustrated that the implementation of traffic calming in the form of speed humps has been successful in reducing the number of PVCs and the severity of pedestrian injuries in both Chatsworth and KwaMashu, with KwaMashu enjoying a greater protective effect. These statistics support a decision to install speed humps in the roads constituting routes to schools in other areas within the eThekwini Municipality. A larger study, using a quasi-experimental design to provide more reliable evidence for the implementation of traffic calming around schools in the Municipality, would offer further confirmation of the pleasing results of this study.